Woven napa slingback. V-shaped topline. Elastic back strap. Leather lining. Leather sole. Heel height 3 cm. Hand made. Yellow leather pump. Leather sole. Leather lining. Heel height 9 cm. Made in Italy. Hande made. Patent leather pointy toe pump. Adjustables T strap. Heel measures 6 cm. Leather sole. 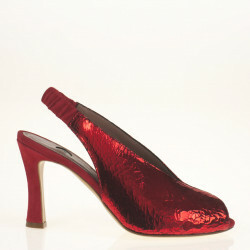 Patent leather pointy toe pump. Adjustables strap. Heel measures 3.5 cm. Leather sole. Leather insole. Hand made. Made in Italy. Leather pointy toe pump. Adjustables strap. Heel measures 3.5 cm. Leather sole. Leather insole. Hand made. Made in Italy. Leather sandal. Heel height measures 11 cm. Leather lining. Leather sole. Hand made. Made in Spain. Metallic leather sandal. Heel height measures 10 cm. Leather lining. Leather sole. Made in Italy.